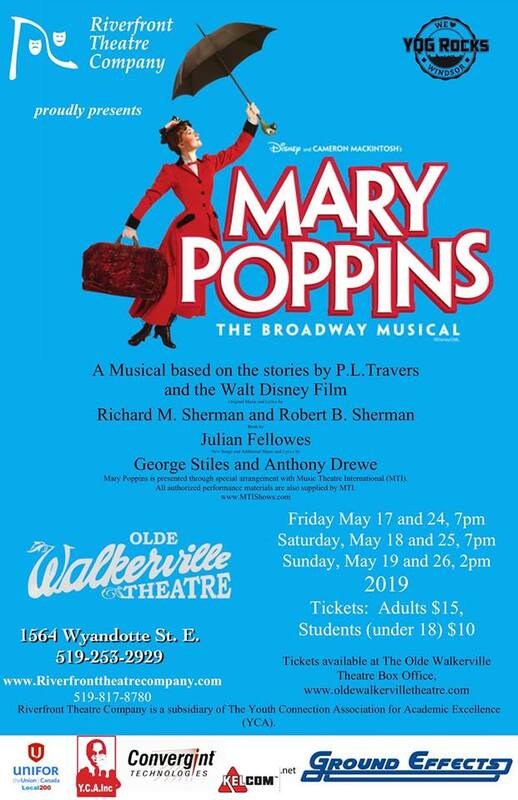 Friday, May 17 and 24, 10 a.m. school performance (advance booking only)Friday, May 17 and 24, 7 p.m.
Saturday, May 18 and 25, 7 p.m.
Sunday, May 19 and 26, 2 p.m.
Everyone’s favorite practically perfect nanny takes the stage in this Supercalifragilisticexpialidocious musical adventure. One of the most popular Disney movies of all time is capturing hearts in a whole new way: as a practically perfect musical! Based on the books by P.L. Travers and the classic Walt Disney film, Disney and Cameron Mackintosh’s Mary Poppins delighted Broadway audiences for over 2,500 performances and received nominations for nine Olivier and seven Tony Awards, including Best Musical. In May 2019, Riverfront Theatre Company will bring Mary Poppins to Windsor!